Developing critical thinking and asking questions when reading is a good way to remain actively engaged with a topic and to retain learning. Or maybe you are in a discussion which seems to not be going anywhere, what is missing or needed to help move things forward? It might be asking questions! Asking good questions at the right time leads to getting good answers. Edward De Bono’s six thinking hats are based, in part, on Kipling’s six honest men. The scheme is well known and whilst it may seem a little dated, there is room to dust off the hats and put them to good use. So, how do the hats relate to technology and productivity anyway? The hats or honest men are really another tool to bring out when working and studying, they can also be used to develop good communication skills. As open questions they should lead to more information than closed ones, which often result in one word, yes or no answers. Active reading and learning involves asking the same kind of critical questions of the author as you would or a person. Getting better answers, leads to better understanding and therefore an increased probability of a better outcome. As to practical application; I use sticky notes or highlighter pens (physical or digital) the colour of the hats to write a question, make comment or add a marker. For example I would use green hightlighter for interesting and novel content or yellow where I see a benefit or positive. Using this scheme allows for quick reference back to sections read and to the questions or comments I made. I should here credit Anna and Lev Goldentouch for suggesting this novel use of the hat colours, on their Key to Study Skills Blog. Sometimes, I also use the hats to help construct mind maps in order analyse information or a situation. 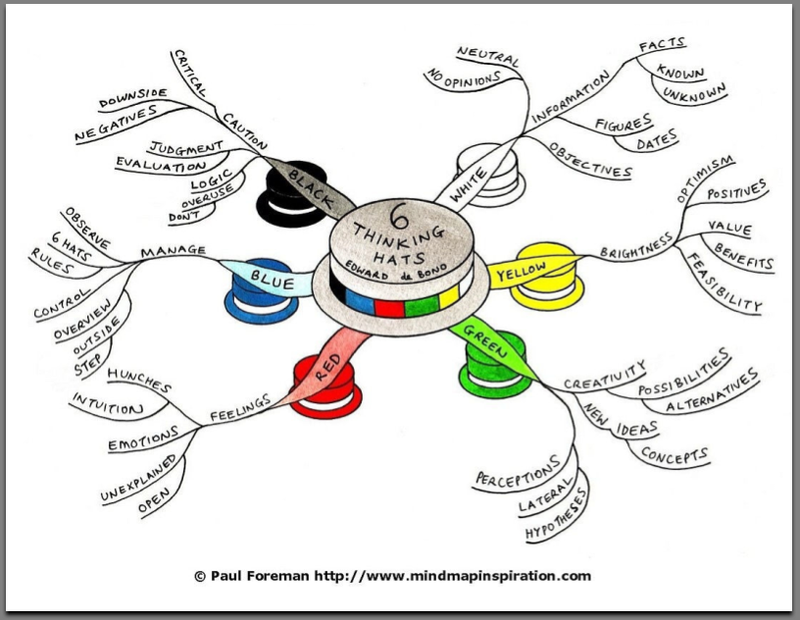 There are ready made templates for mind mapping software such as the excellent, open source and cross platform, Xmind  . Below are links to a couple of quick < 3mins youtube videos to reiterate and to learn the system. The first  is Edward De Bono himself discussing how the hats lead to a better outcome compared to using argument alone. The second  is a simple review of the six hats. For the eagle eyed, you will by now have noted that this is not about task management, nor outlook. Apologies, I have decided to write a series of things you can do with outlook, hence a delay. Hope you feel free to ask questions and leave comments (though it is not possible in colour! ).